The EI Goal 3 project builds on the promising evidence identified in a Goal 2 project (R324A070008) funded by National Center for Special Education Research at the Institute of Education Sciences. The project was conducted from 2007-2011 at University of Florida under the Direction of Patricia Snyder with collaborating partners Mary-Louise Hemmeter (Vanderbilt University); Susan Sandall (University of Washington); and Mary McLean (previously University of Wisconsin – Milwaukee). As a development and innovation project the project involved three key phases. Development – The team worked to develop the professional development (PD) intervention known as Embedded Instruction for Early Learning – Tools for Teachers (EIEL:TFT) toolkit and refine processes for workshops and coaching. We further validated the content and format of the PD intervention with an expert panel of key stakeholders. 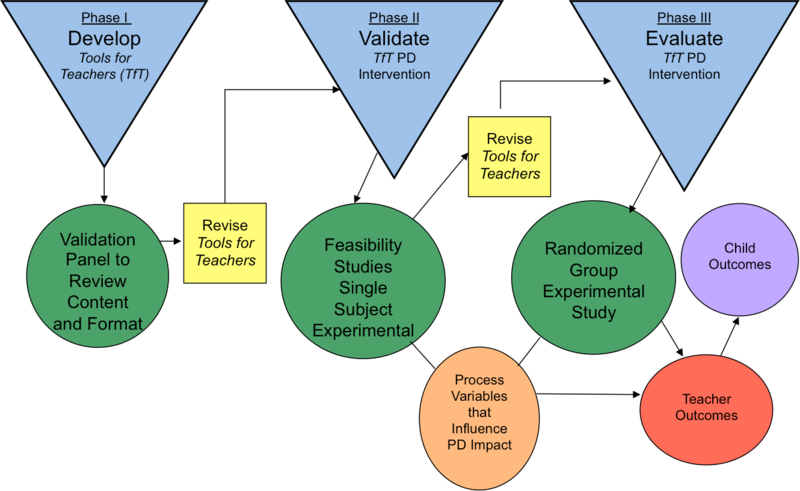 Test Feasibility – The PD intervention was piloted using iterative validation procedures and conducting a series of feasibility studies with 12 teachers. Examine Potential Efficacy – The PD intervention was examined using experimental trials with 36 teachers across 3 states (12 teachers in each state). Teachers will be randomly assigned to 1 of 3 conditions: on-site coaching or self-coaching) or a business-as-usual control group. The EI Goal 3 project is funded by National Center for Special Education Research (NCSER) in the Institute of Education Sciences (IES) Project Number R324A150076. The opinions expressed, however, do not reflect the official position or policy of the US Department of Education and no official endorsement should be inferred.